Climate: issue to talk and concern about. Five minutes ago we had over 35 celsius with heavy sunshine, and all of the sudden heavy showers with strong T-Storms with breaking trees and large icy storm that hits everywhere. I have flood coming into the apartment just during this 3 minutes. Is this snowing in June? This is worse than hurricane and I hope that electricity will go on until the end of the post. 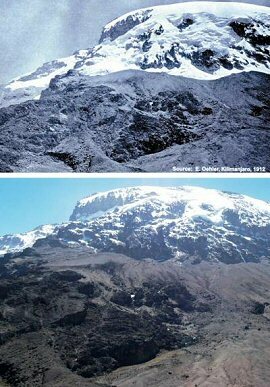 Anyway, take a look of the article on Kilimanjaro’s icecap related to global warming.